Stop me if you've heard this one. A man, impressed by Neiman Marcus's chocolate chip cookies, buys the recipe from a waitress who tells him it costs "two fifty". He adds it to his tab and is shocked to be billed $250 instead of the $2.50 he thought it would cost. In anger, he forwards the recipe via e-mail to everyone he knows. Of course, that's an urban legend that has since been debunked (although the people who did try the recipe claimed it was pretty good). This recipe for lechon manok has similar dubious online origins; the site I got it from got it from another site, which got it from another site. 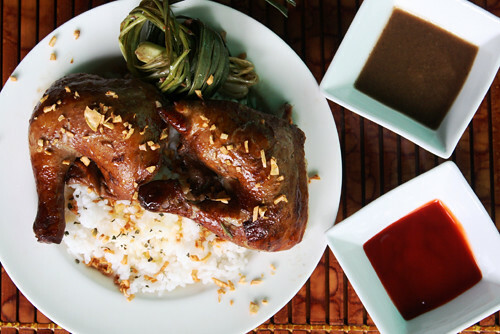 Still, I had the strongest craving for Andok's lechon manok (roast chicken) when I saw this recipe, so I had to try it. The chicken came out surprisingly tender, hitting slightly sweet, sour and savory flavor notes. Don't be alarmed by the short marinating time; the flavor really does seep into the meat and marinating it for more than a few hours will just make the flavor overpowering. Go ahead and pair it with Mang Tomas and catsup. Because everything tastes better with more garlic. 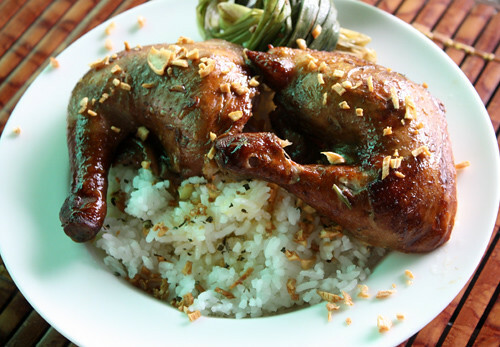 Marinate the whole chicken in soy sauce, calamansi juice, minced garlic, chopped onions, soda or beer, sugar and pepper. Let stand in the refrigerator for 1 to 3 hours. Stuff the chicken cavity with tanglad. Cook chicken on grill or in oven until golden brown. Thanks for a great sounding chicken recipe, can't wait to try. And for sure bring on the garlic always got to have more. A real informative blog like this is an exceptionally cool helping resource for a needy information seeker like me! Thanks a lot for sharing. Janelle Año, 22 y/o, Manila. I don't eat to live; I live to eat. I created this blog because I have all these recipes percolating in my head with nowhere to go. Spuds and Friends is the outlet for my epicurean (mis)adventures and food photography. You can reach me via e-mail.